My Wake UP Call to Passion – Find and Live Your Passion with daily inspiring messages from Passion Expert Janet Attwood. 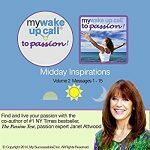 My Wake UP Call to Passion is part of a series of patented inspiring, motivating messages invented by former longtime Broadway star, Robin Boudreau Palmer. 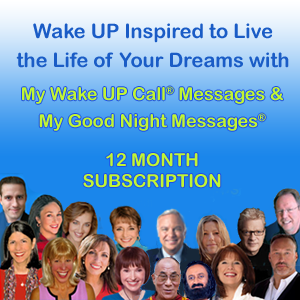 My Wake UP Call Motivational Alarm Clock Messages & My Good Night Messages are uniquely structured, morning and evening five-minute messages with renowned experts and thought leaders, who bookend every day with inspiration to achieve your personal goals and dreams, instead of with blaring buzzers and negative news.